I recently purchased a Canon 5D Mk II. A fine camera it seems, and the added resolution will be helpful. 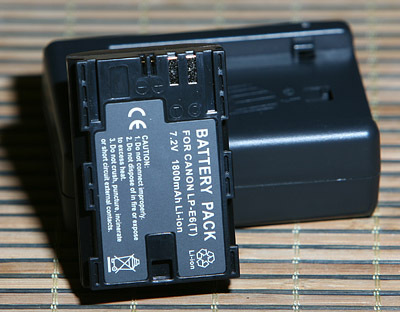 One small issue is that Canon redesigned the battery. Well, times change and things progress, and we can always use better batteries. It uses the LP-E6 battery and the camera is not compatible with the good, old BP-511. Dang – the spare batteries I have for my old camera won’t work. So, I’m in the market for a new spare battery. A brand new, Canon LP-E6 costs around $80 plus shipping. Ouch. But, I find a great deal: an LP-E6 plus a charger for $60 from USBattery.net (Uh-oh, that’s “.net” not “.com”) I order one. Well, it turns out that it is not, as it states on my order confirmation, a Canon LP-E6. Rather, it is a replacement for the Canon LP-E6. Except that it is not compatible with the Canon charger. Nor is the new charger compatible with the real Canon battery, I presume. Great – I have two batteries that look pretty much the same, but require their own chargers. Any time I travel, I have to pack two chargers. Sure, I can use the battery, but this message means that the camera can’t tell how much charge is left in the the battery. 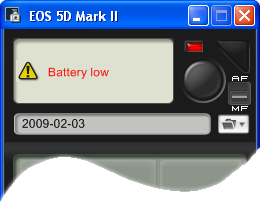 So, a fully charged battery appears to be dead, according to the camera. 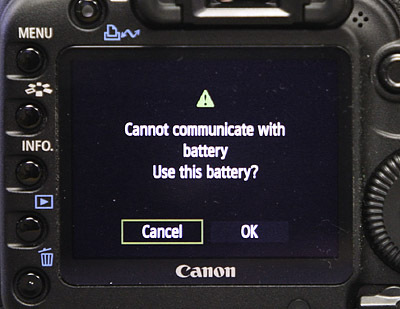 What I have is a replacement for the Canon battery, except that it doesn’t work in the Canon charger, and it isn’t compatible with the camera. Martin – Since you have used both the 5D and the new Mark II, what are you feelings. I have been weighing the pros and cons of purchasing the Mark II and have only an assistant’s feedback so far. Unfortunately, my assistant is coming from a Nikon experience. So it really isn’t apples to apples. The image quality is great (no surprise). And the noise handling is yet another leap forwards. This is helpful to me as it lets me trade off ISO against aperture to extend my depth of field a bit. And the extra pixels give me a little more room for cropping if needed. My experience with the 5D is that the shutter lag is inconsistent, something like 60 msec +/- 5 msec. For any usage except what I’m doing, I can’t see that that would make any difference. It has been frustrating for me. The Mark II, on the other hand has a shutter lag of about 90 msec +/- 1 msec. I wish it had a shorter lag, but consistency is more important for me. In the end, I may well end up with an external shutter so all this will fade. If I think of other things, I’ll try to remember to update. Thanks for your insight. One issue I have had and continue to have with the 5D is what I call shutter bounce. When using long lenses, tripod mounted to the lens, I get an obvious motion blur at almost all shutter speeds. When the camera is mounted to the tripod, this effect seems to be minimized. I have seen the same results in my macro work. But it doesn’t seem to matter if the lens or camera are tripod mounted or it I use the remote trigger, mirror up and a few second delay before shooting. Similar techniques with my old 10D result in reasonable sharp images, considering the chip. I would imagine with your technique, you don’t have this problem. Though I am wondering if you have experienced it in other areas? I think you’re right, Kim, I wouldn’t have seen any shake as I am stopping motion with the flash pretty well. Looking at the specs, the 10D has a shutter lag longer than the 10D and, of course, the shutter is smaller than on the 5D. Being bigger and faster, it makes sense that the 5D shutter might have more shake. The 5D Mark II with it’s slower (and quieter) shutter than the 5D, might well have less shake.